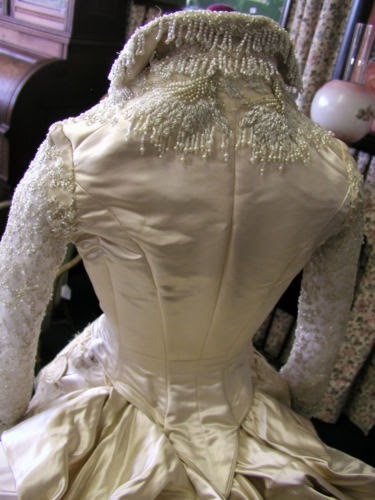 1880's Massive Silk beaded Wedding Gown Brooklyn Museum of Art: This 1880's silk bustle wedding gown was purchased from one of the Augusta Auction's and came from the Brooklyn Museum of Art. Several of my European customers have asked for a chance at this dress so here goes. 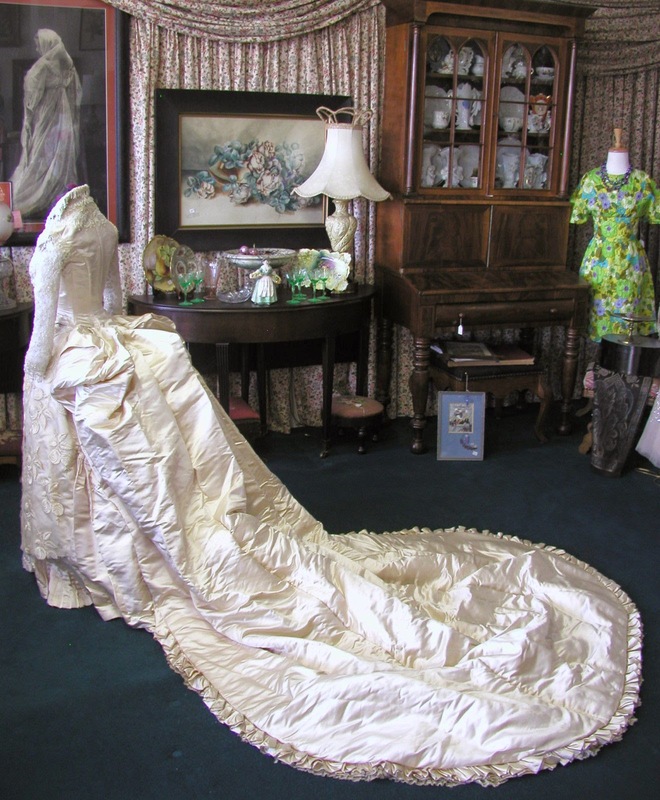 This is one of the most spectacular wedding gowns every offered on ebay. 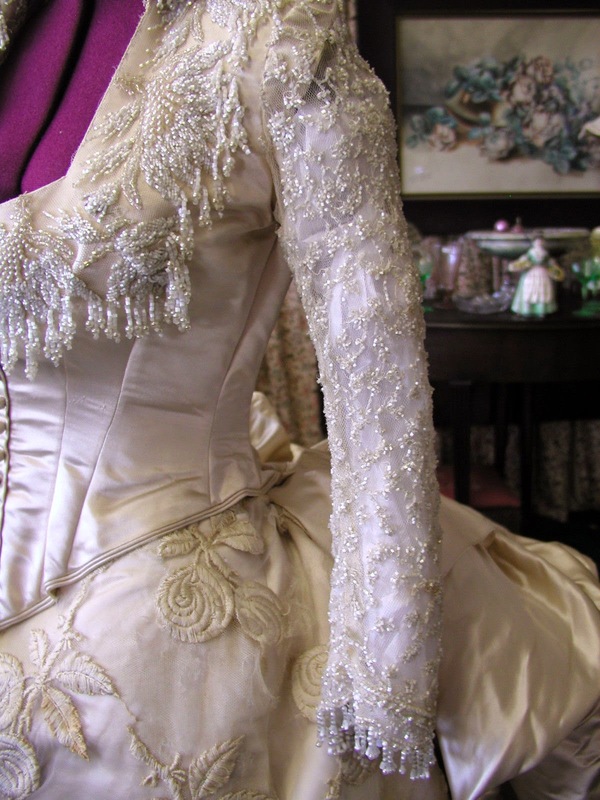 The dress was created in the 1880's of heavy ivory silk. 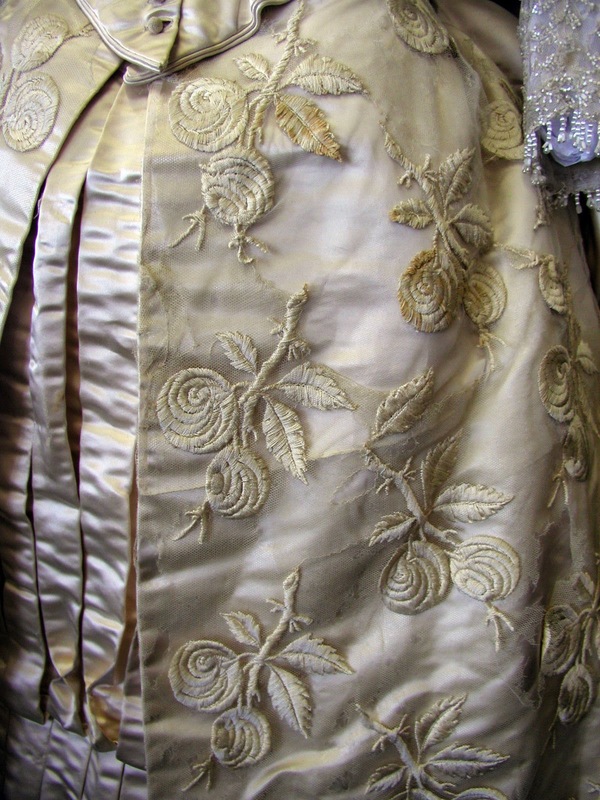 The bodice has a lining of silk. 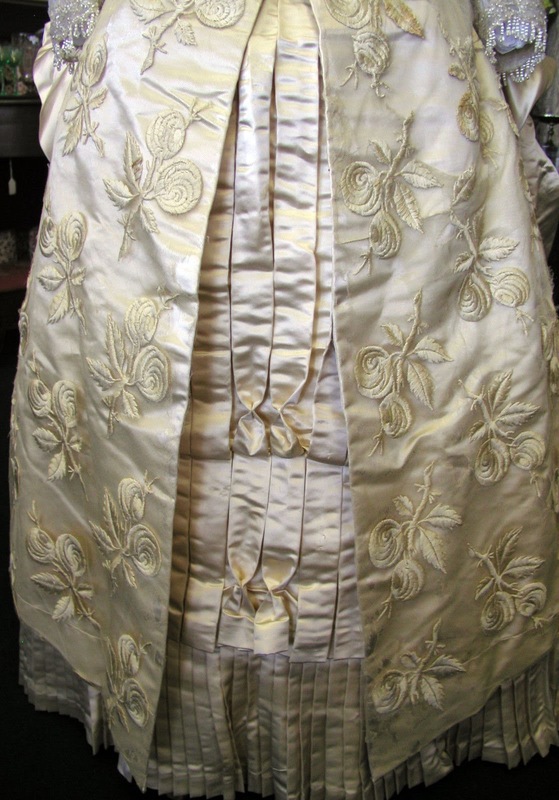 The lining is in very good condition.The bodice has sleeves of netting that are beaded with bugle beads and pearls. 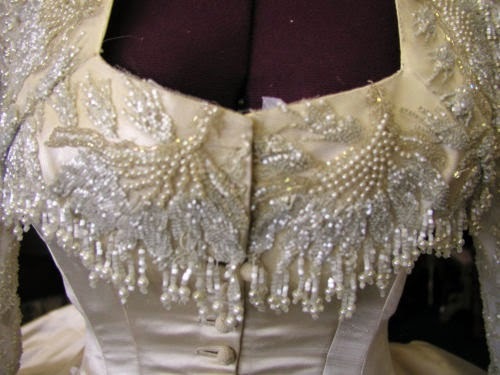 The neckline of the bodice is heavily beaded with pearls and bugle beads in ivory and cream. The overall condition of the bodice is good to excellent with only minor bead loss. The bust is 31, the waist is 22 and the shoulders are 13. 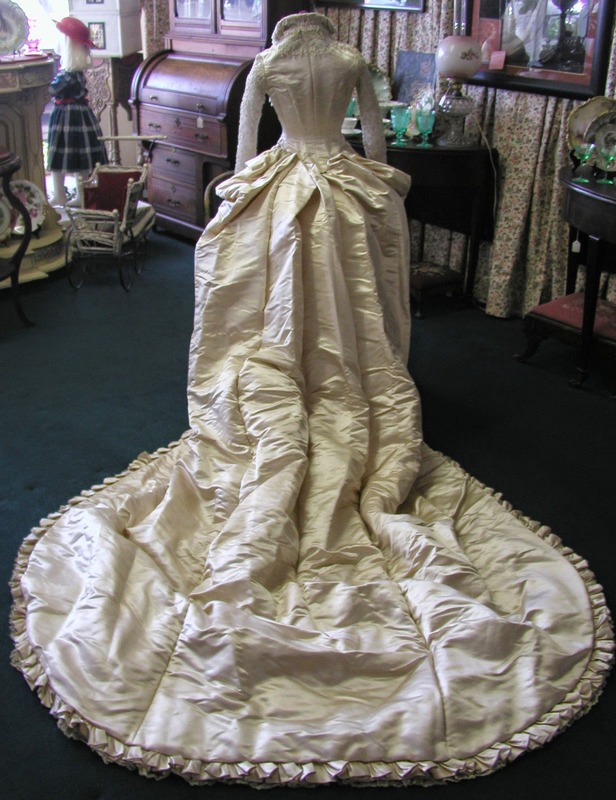 The skirt was made of heavy silk and the outer skirt is in good to excellent condition with only some minor spots to the silk. 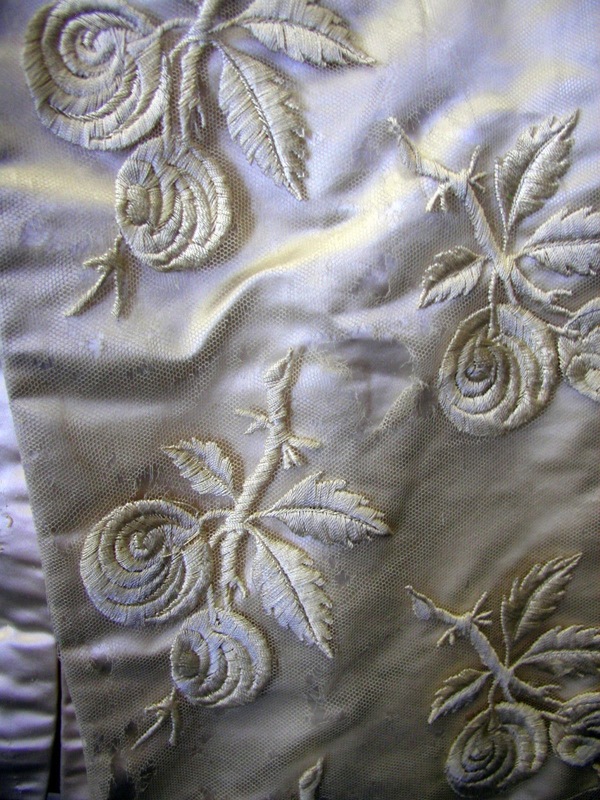 The silk netting on the front of the skirt which has the large embroidered flowers has started to split and tear in places. It needs to be conserved. There are a few spots where someone started conservation with white net. The flowers do have some staining. See photos. 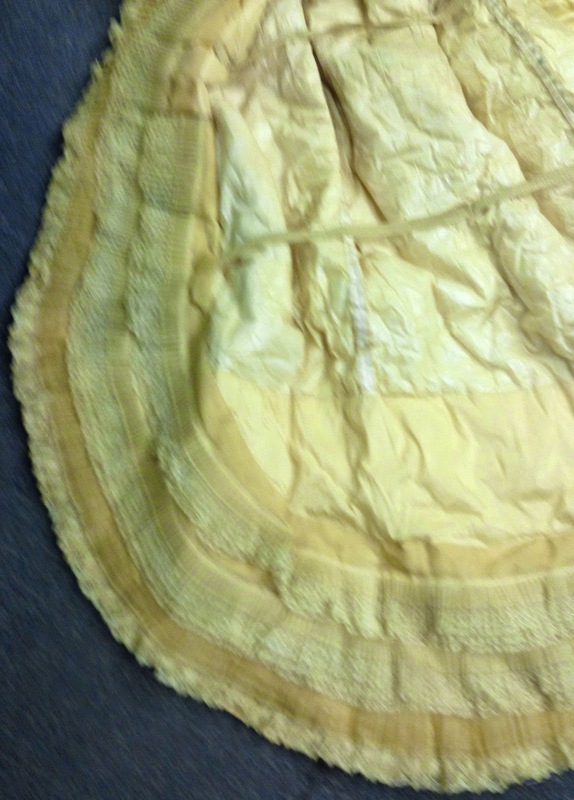 A small section of silk at the top waist band front and back is splitting, though this is not seen with the skirt and bodice is worn together. This silk is not part of the heavy silk that most of the skirt is made of. The silk lining inside the skirt has some wears and tears that need to be stabilized and the pleating on one side of the back needs to be sewn back in place. The skirt length is 38 in front. The waist is 22.5 inches and the length of the train from the back waist is 92 inches. It is a cathedral train. We have additional photos of the dress with the photos of the lining condition and the waist band issues. Please email us if you want those as well. The reserve is less than the buy it now. The bidding will start at $0.99. This is one of those I wasn't sure whether to post or not. I'm really not sure this is actually an extant garment. The skirt is, but the bodice looks to have had some work done. Also, I couldn't find the Augusta Auction page (probably just means they never took pictures of it). 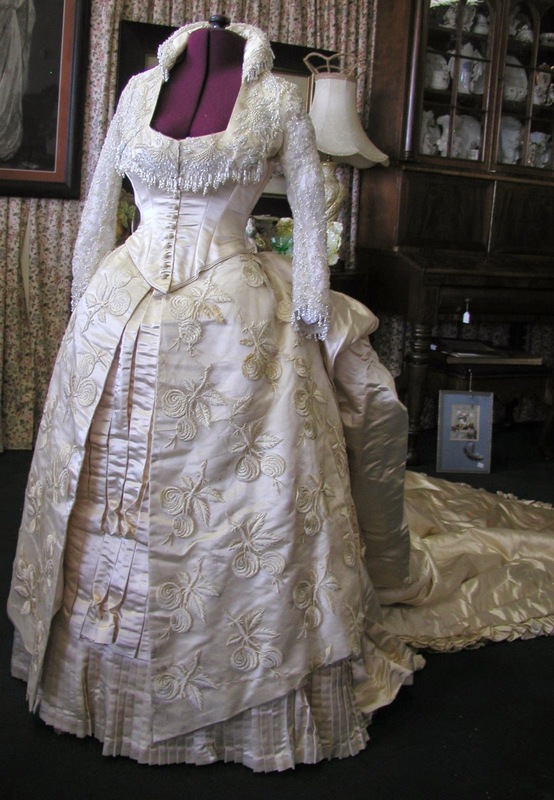 The dress is from the 1870's (the collar was VERY popular then).